Sgt. Daniel Logan, my father, first enlisted shortly after the declaration of war at a recruiting office on Jarvis Street (Cawthra Square) in Toronto. The recruiter told him his age, which was 31, would go against him and they were looking for younger men especially for aircrew duty which my dad had applied for. He waited for a month without ever hearing back, the original recruitment office had been moved and many applications for enlistment had been lost. So he again filled out the enlistment forms this time lowering his age on the form. As it would happen the interviewer was the same one he had the first time and he remembered my father and so persuaded him to apply for Airframe Mechanic and told that he could remuster later for aircrew. Told to report to the Manning Depot located in the Exhibition grounds on the South side of Toronto was a welcome surprise as it was only a short streetcar ride from home. The government had gone to no expense to provide accommodations for the increasing number of recruits posted to the Depot . The new arrivals were each presented with a broom, shovel or bucket and brush to clean out one of the stalls in the Equine Building. My dad said at least the horses had a better deal then the recruits, the horses were only one to a stall, the new arrivals were four to a stall. The good luck was not to last, a parade was called a few days later and the officers counted out a number of men to step forward, collect their kit and report to the train station just North of the Exhibition grounds. Next stop No.2 Manning Depot at Brandon Manitoba. So it went from just a street car ride to reach home, to a long train trip to a part of Canada that he and many of the other men had not ever seen before. My mother somehow managed to follow him out there along with a number of other wives who pooled their money for accommodations and meals in a small boarding house near the base. After six weeks the train again brought him back to Ontario, but my mother had to follow a little later as the priority for travelers was for servicemen. 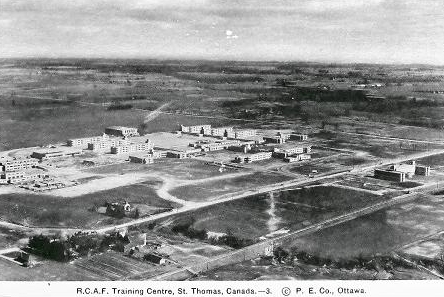 The large training center for all the trades No.1 Technical Training School , was located at St. Thomas, his next home for six months. Meanwhile things in Europe were getting worse, Hitler’s troops had already rolled into France, Holland and Belgium and the general feeling of the recruits was that they may never get overseas and the fighting would end up being much closer to home. It was all up to the outcome of the Battle of Britain taking part in the skies above England while my father was learning his trade. These thoughts were not to deter the government and so the training for the future ground crews went lumbering along as if the war would last forever. The biggest challenge for all the trainees were the monthly exams, getting top scores was the best way for future promotions. The courses covered a lot of different skills; airframes, aero engines, woodworking, machine shop, cable and rope splicing, soldering, welding and anumber of other skills. ( courses seem to be more general in nature then what would be normal later on in the war) Many of the men felt that it would be hard to continue passing these monthly exams, in the end the few older men like my father who had some work place experience in some of these fields found it for much easier then their younger classmates. As good as the instructors were being proficient in multiple skills was not possible for every trainees. This difference maybe could have led to the decision to revamp the courses and concentrate on specific aspects of each trade. The passing members of the class were split up into two groups, with one being posted to No. 8 SFTS in Moncton and the rest including LAC Logan posted to No.1 CFS Trenton. Trenton was still in Ontario so driving home to Toronto on Leave was possible, if they could get enough of them to supply ration coupons for gas to Toronto and more importantly back to base. So no matter what the weather, when it was time for Leave all the Toronto bound trades headed for one of dad's friends who had a "car", of sorts. Little or no brakes. patched up tires and roof, patched up body work then overloaded with men, baggage and spare parts they would head off for Toronto or as close as the old thing would take them. Eventually dad found four tires to replace the ones that were "liberated" from his old Chevy which was parked in a garage back on Banks Street. Now he and the others had a source of safer transportation for their back and forth journey along the old Highway # 2. 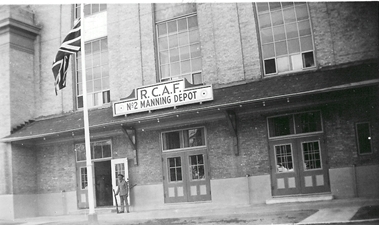 Trenton was the show place of the RCAF, every type of aircraft flown would eventually show up. It was while at Trenton he was given his first flight, after completing repairs on one of the aircraft he was required to have the aircraft signed off. Jumping at the chance to be airborne, the test pilot gave him the works, loop the loops, figure eights and inverted flying. Of course the pilot was having a ball, swearing and cursing as if there was something wrong with the the aircraft but after awhile he broke into laughter. For dad it must have been a glimpse at what he wanted to be doing his pay book shows many entries as eligible for flight pay. The life at Trenton seemed to be more about "VIP Parades" then actual service work, although the varied experiences of working on a range of different aircraft would pay off later for now, it was not what he was looking for, he wanted to get to go overseas. He was offered a post to a new SFTS with the understanding that it could lead to the overseas posting he wanted. 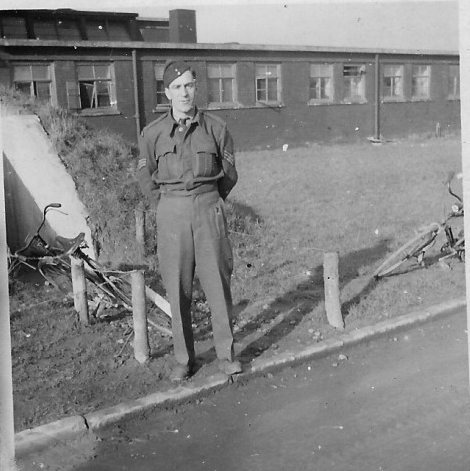 Promoted to Corporal and posted to No.16 SFTS at Hagersville, when he arrived the base was a bunch of empty buildings, empty hangers and no supply of water. The most important duty seemed to be guarding the limited water supply brought in each day. In a short time the situation improved the base came alive quickly and he applied for testing for rank of Sergeant. The main aircraft in use were a few Harvard's but mostly Ansons a twin engine trainer used as the first step to multiple engine aircraft used by both Coastal Command and Bomber Command. Having passed the tests he found the extra stripe became an asset for acquiring some of the scarce parts needed to keep the aircraft in serviceable condition. There appeared to be a shortage of parts for the Ansons and reasons best known to some officer in the base HQ the category "A" units were not being used for salvageable parts. 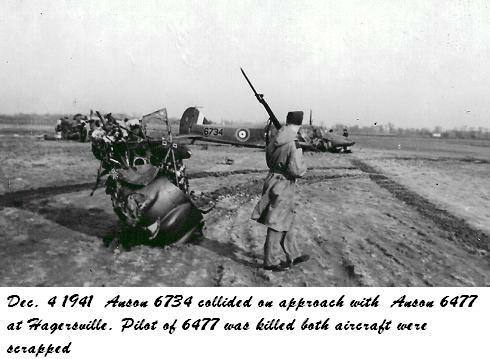 When he found that one of the Ansons that was being stripped of parts to repair others had only 30 hours flying time on it, he stopped the robbing of parts and began to use the salvageable parts from the non-repairable Ansons. The unfortunate fact of being at a flight training base was the loss of men from accidents and crash landings. This was reflected in his thoughts as he made the notes that I am using. The fatal crashes, the funeral parades must have brought home to everyone the dangers and reality that surrounded them even in this back water location far from the extreme dangers yet to come. His transfer to an operational squadron overseas came through just as his project Anson finally came ready for it's flight check out. His papers were delayed for two days until the Anson could be signed off by a test pilot and himself, no one wanted to go up in the aircraft even though it was in better condition then the other basket cases being tested. On leave for a week back in Toronto, he informed my mother of his transfer overseas and his plans to apply for aircrew as Flight Engineer. 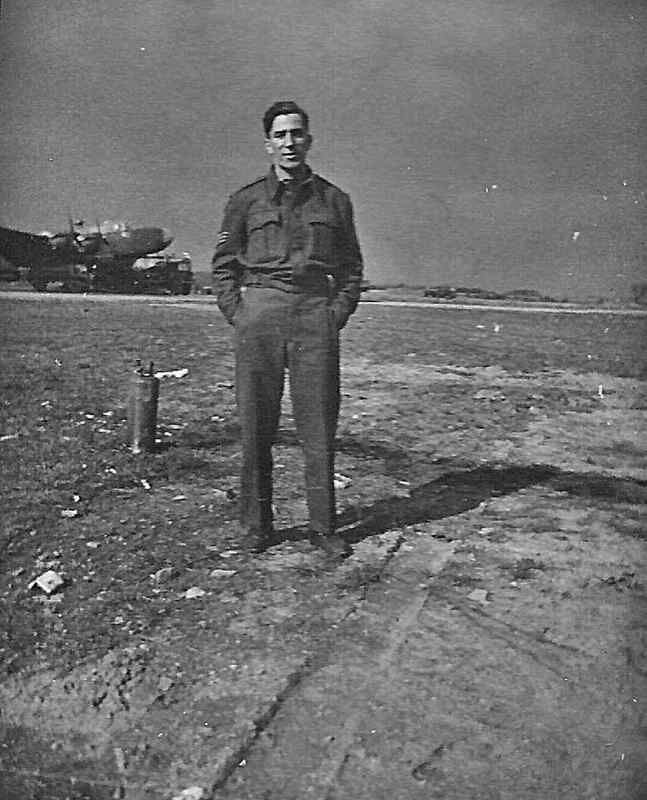 Before leaving for Halifax he gave into my mother's wish not to apply for aircrew and after an emotional farewell at the crowded Union Station in Toronto, he was headed off for Nova Scotia. With the usual military rush to get things moving proving unnecessary as he and 2,000 other airmen waited two weeks in Halifax, each night waiting and packed to be called to march to some awaiting ship. Finally the notice came and in as secret a fashion as 2,000 men marching through the darkened streets of Halifax could do, they found themselves on a dock facing the largest ship any of them had ever seen. The ship was discharging war brides, wounded soldiers and a large group of American soldiers who were under arrest and on their way to US prisons. But again it would be a waiting game that lasted six hours, as he and the others stood in typical Halifax March weather. None of the officers gave an order for the men to put their kit down, and slowly on their own they took their kit bags off their back and placed them on the ground. Some Army Service Policeman started ordering them to pick them back up, but generally no one did. Sgt. Logan was picked for Duty Watch, which had some advantages prior to the departure. Even though he boarded on Wednesday night it was not until the following Monday that the ship departed. From a vantage point in one of the gun emplacements he observed train load after train load of troops arriving and being boarded. The uniforms of a wide range of nationalities fresh from training camps across Canada packed the boat to well past it’s capacity. The ships guns were one of the few open spaces available and where under the control of US troops who very strictly kept them off limits to all. This was made abundantly apparent by the menacing armed guards posted at each gun battery location. One of the perks of being on Duty Watch was that he wore a Service Police arm band so the Americans in the gun positions allowed him access and a vantage point to watch the parade of men and materials being loaded . By now the ship was almost wall to wall men. Bunks in some areas were stacked twelve high. Being an NCO on Duty Watch he had a room with only eight others. Of course the room was only designed for four, without huge kit bags taking up even more of the small cabin. He had two memories that stood out before the departure of the ship, he watched on Saturday night as a convoy of ships slipped out of Halifax harbour and out into the dark veil of the winter Atlantic. The next morning a number of the ships returned all shot up and badly damaged, they had only been gone a day. A chilling picture of what was ahead for this troop ship on its voyage to Britain. The other memory was being assigned to a detail to watch over a group of high ranking prisoners who were held in the ship’s brig. They were not to be talked to or to be mentioned to anyone on board and soon a contingent of RCMP officers took over the prisoners and no more was seen of them. When the ship left port his Duty watch responsibilities were now to be in charge of a crew of men who were to manually close the water tight doors on a deck that was so far down in the ship it would have been impossible for anyone to escape from. Getting to his meals was a challenge as the ship was so crowed he had to start almost an hour before his allotted meal time. Being on Duty Watch did allow him to go to the head of the line but it wasn’t much of perk. A Lifeboat drill was held but it was plain to all that there was no way to save even a small fraction of the men on board. The line-ups of men at the drill ran for hundreds of yards and in places were ten men wide. At one point while making the journey to his meals he noticed the distinct rays of daylight coming through one of the port holes. One of the soldiers on board had scraped the black paint off the porthole glass at some point in the voyage. When he attempted to bring it to an officers attention he was told to "bugger off’ by an Army Lieutenant. So Sgt. Logan went to the ship’s Duty Officer and reported what had happened. The Duty Officer said he would take care of it and advised my dad it might not be good idea to go back through that part of the ship on his own again after the naval officer "talked" to the culprits. As with all RCAF personnel Sgt. Logan was sent by train to Bournemouth. Bournemouth was a lesson for all new arriving Canadians, the war became all the closer with France within sight and the odd Luftwaffe attack, rationing, blackouts, Fire Watches, air raid alerts but mostly the rationing. The excellent meals on board the ship were now a thing of the past. Everyone was posted to commandeered homes stripped of furniture and full of bunks, but all the eating was at the hotels using ration cards. After a very short time he was posted to 419 squadron, he traveled to the original home of the squadron at Middleton St. George. 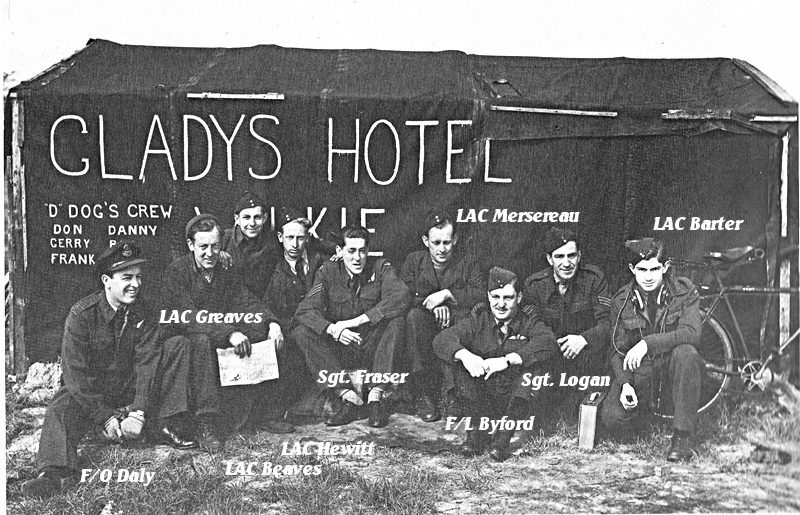 At this point in the squadrons history the personnel were made up of RAF members who the Canadians were now replacing as the training in Canada picked up it’s pace. 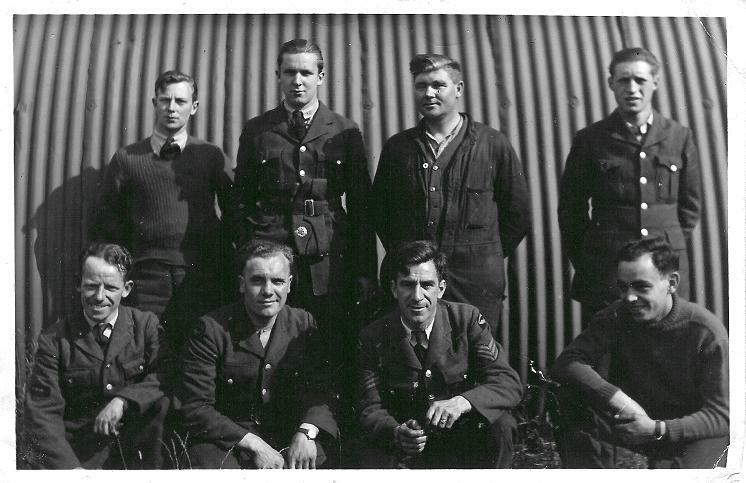 He found the RAF trades men were great to work with and they in turn were not eager to leave the advantages or lighter discipline of the Canadian squadrons. 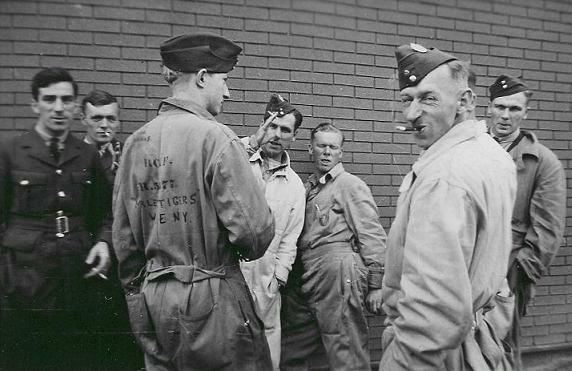 The RAF officers were not that well liked, their references to the Canadians as "colonials" and other of their remarks did not go over well with many of the Canadians. This is a pattern that is mentioned in many of Canadian's air force members memories of their encounters with some of the RAF officers. 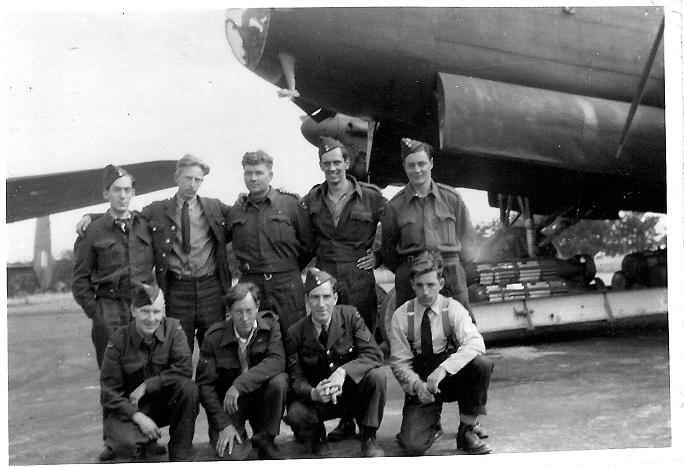 This was not a problem that was found at just the lower levels, it must be remembered that even as high up as "Bomber" Harris, he too had strong feelings against Canada having it's own squadrons let alone Canada having it's own bomber group. 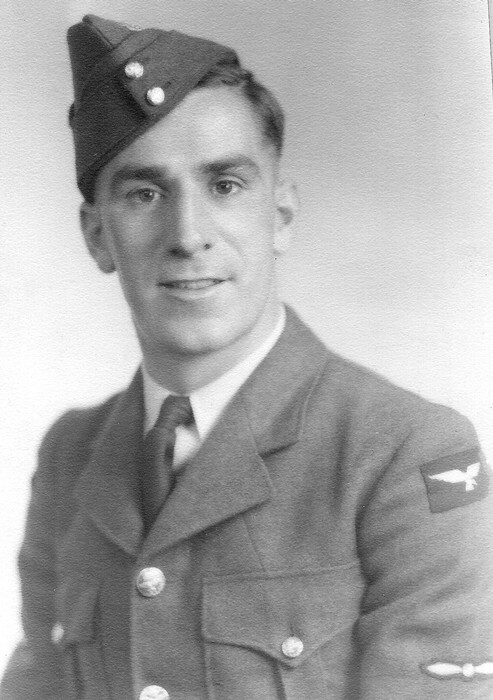 One other of dad’s service mix-ups came at this time when he was told he was really with 420 squadron and was to be posted to Africa. Which seemed to be an adventure itself and a chance to see the territory his father had served in 50 years earlier. His postings was straightened out before they could ship him out. 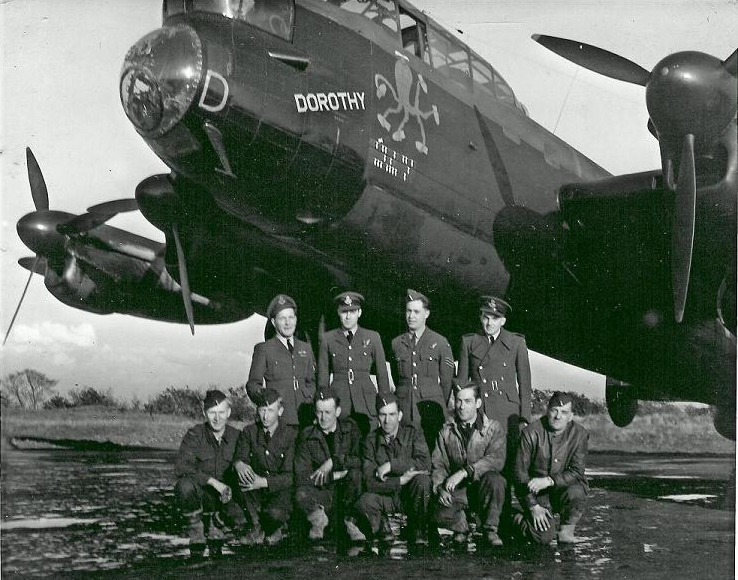 Now firmly with 419 he started work on the squadron’s Halifax bombers. While working on these aircraft he was to brought into the danger zone on at least two different occasions. 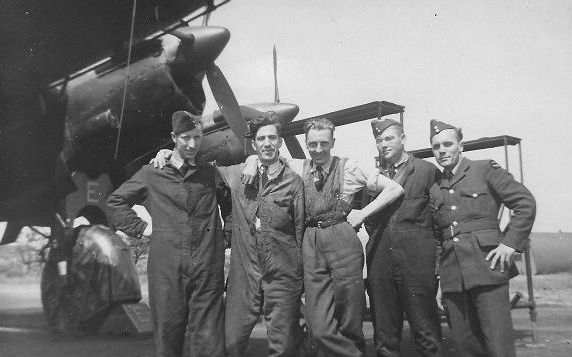 A new Halifax was delivered to the squadron and was being checked out when Sgt. Logan was in the makeshift dispersal hut hunting for a part for the engine nacelle when a loud bang sounded outside and something hit the hut very hard. When he ran outside the Halifax was sitting on an angle from a punctured tire. At first he thought that was all it was until he saw the slight hole in the ground under the bomb doors, holes in the fuselage . What really struck home was the two ragged holes in the port engine nacelle on which he had been working. An investigation followed which determined that a small practice bomb had fallen out when the bomb doors were opened. It shouldn’t have gone off and it should not have been there, the aircraft's log showed it had been a number of days since the Halifax had been armed for practice runs. 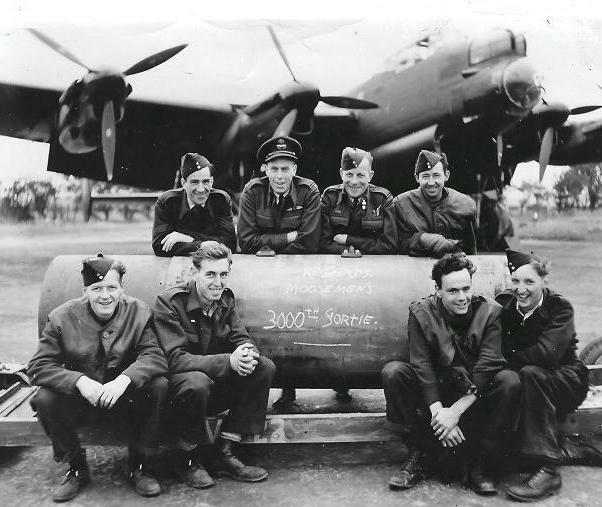 There were at least two incidents of Halifax crashing on takeoff at Middleton St. George, during one of the crashes the bomb laden aircraft was out of control while still on the main runway before it exploded on impact after the under carriage collapsed sending the bomber on it's fatal final resting place. 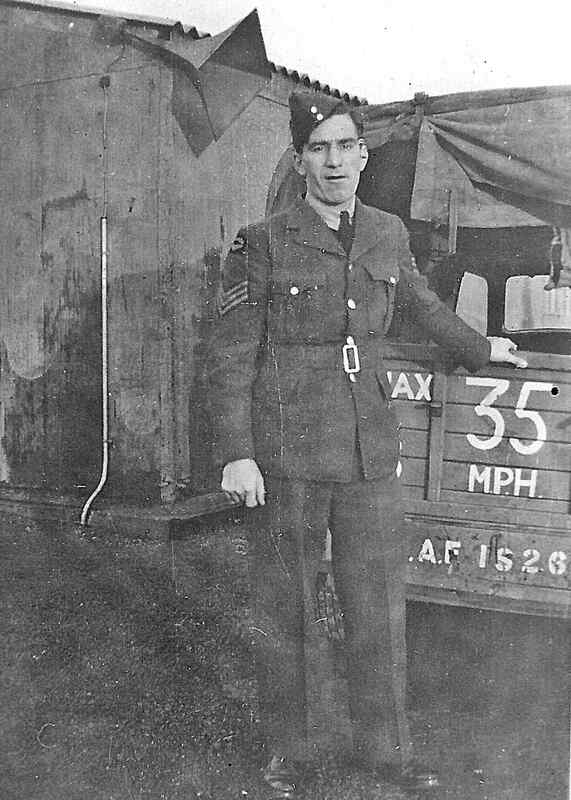 My father described the effects of the blast as pulling the skin on his face back tightly and jarring the truck he was in with great force. The blast in fact tore the canvas cover off the rear of the truck. But what shocked him next was the truck ahead of his with Flight Sergeant Sinclair riding in it had been completely thrown over. He and the driver were running to help F/S Sinclair and his driver when they saw them get out apparently unharmed. Everyone was now looking to help those on the crashed aircraft, the crew all from another squadron were all lost in the crash. He had two other encounters these times with friendly fire, the first one which was being fired on by one of his own crew’s gunners who had fired off the quadruple tail gun for testing; with out sectioning off the area or obtaining permission to fire the gun. The second time was on a checkout flight after a series of repairs. While completing a wide circuit and returning back to base an anti-aircraft battery opened up on them and kept firing while the aircraft's wireless operator and navigator were showing the colours for the day. They completely missed the Lancaster even though it was flying low and fairly slow. Sometimes your father, grandfather or who ever was serving overseas will not mention the moments best left forgotten. I happen to overhear this best forgotten moment, when a number of dad's friends from the squadron were visiting us many many years ago. It seems that after a lengthily visit to the local English pub, some of the others decided as they walked back in the early hours to base decided that it would be great to have bacon for breakfast and remembering that one of the farms they would pass had far too many pigs. One of the party was a former farm hand and said it would be easy to catch one of the smaller pigs. After a few moments, probably more, the whole group had joined in the fun and were covered in mud and other pig sty matter without even getting close to catching the pig. By now the farmer who had been watching the fun asked them if they didn't have some other things to be doing. Then someone in the muck covered uniforms remembered there was a full parade with a group of dignitaries arriving from HQ that morning. So with one shoe and one cap missing they raced off back to base, only to find it was later then they thought. At the gate with their passes handed over and them all still covered in what have you, plus smelling like a barn yard. The guard informed them that the parade was already in progress and their was trouble with their passes. An officer showed up, with a sombre stern face and walked up and down the men standing out side the base fence, they weren't allowed into the guard room in the state they were in. He demanded to known if they realized what the time the passes stated they were to show up at was. With no reply to his question, the officer turned and walked off telling the guard Sergeant to "give it to them". The Sergeant with great purpose and strict orders called them all to attention then told you " you stupid buggers this a two day pass, your still on leave" then turned and walked away. The squadrons had mostly wound down combat operations and ground crews were preparing to get the Lancasters back to Canada. Dad wanted to go back on one of the Lancasters but missed out on the seniority draw. He had put in for "Tiger Force" and the next thing he knew he was posted to "Tiger" squadron ? At first he found it confusing but since they were acting as an occupation squadron and still flying, it gave him the opportunity to fly on a number of observation flights over France and Germany. He was finally getting his aircrew request filled even if it was unofficial. From this he saw first hand what he called ‘the unbelievable destruction of the European cities. At last he was posted to Torquay for a short rest stop before boarding a cramped train heading for Liverpool and ship for home. The ship took them all the way up to Quebec city where the men of all the services boarded trains bound for all over Canada. For many it was the end of the war and their service to Canada. For some such as my dad it was just a thirty day leave before heading to Nova Scotia and preparations for Pacific operations as part of Tiger Force. Before the 30 days were up the United States had ended the war in the Pacific and Dad received his Discharge papers in the mail. And it was back to civilian life.